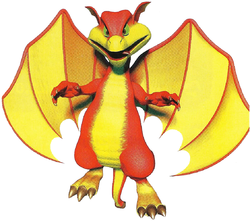 Smokey the Dragon is the fourth boss in Diddy Kong Racing and Diddy Kong Racing DS. The player races him at the end of Dragon Forest in his own stage, Smokey's Course. Smokey even has a Challenge Level named after him, Smokey Castle, although he has no involvement with it. During the game's events, Smokey was brainwashed by Wizpig and entrusted with the fourth and final piece of the Wizpig Amulet. The player races Smokey after they complete every race in Dragon Forest. The boss race is aerial and , as Smokey flies while the player rides in a Plane. Smokey attacks the player by leaving behind puffs of fire that slow them down. When the player completes the first match against Smokey, he challenges them to complete the four Silver Coin Challenges (or Balloon Touch Challenge in the DS remake). The player can rematch Smokey after completing every Silver Coin or Balloon Touch Challenge. Like the previous bosses, Smokey's difficulty was increased for the rematch: he flies faster and produces twice the number of fireballs. Smokey is liberated from Wizpig's control after the player wins the race. He gives them the final piece of the Wizpig Amulet. He is last seen during the game ending where he celebrates with the other characters because of Wizpig's defeat. Like most characters, Smokey has a different voice in the Nintendo DS remake. The boss race's difficult was decreased, as he does not produce any fireballs on the first match and only a few on the second one. This page was last edited on December 28, 2018, at 16:49.